El Gringo Blu-ray Review With some smarts, style and inventive camera work, El Gringo starts the ball rolling on being a classic, but doesn’t quite make it there. The Man (Scott Adkins) crosses into Mexico with a satchel slung around his shoulder. Its contents; $2,000,000 in cash and a lot of bad history behind it. After making the journey on foot through scorching heat, he comes upon the town of El Fronteras. While stuck waiting for the bus that will take him to a comfortable future of sun, cold drinks and beaches, he’ll have to deal with a drug cartel, thieves, a corrupt sheriff, inhospitable locals and a DEA Lieutenant that are all after him and the money he carries. Scott Adkins has been a leading man in the making for years now. Back when I first saw him in the still amazing Undisputed III: Redemption, I knew back then he had the goods and I believe that he still does. After watching this film, I’m still convinced of that. With each film he does, he shows a little more of what he is capable of and in El Gringo, he shows us a bit of everything. 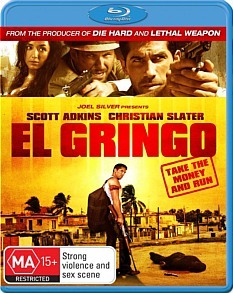 El Gringo is a mix of a film. Smart, yes. Stylish, that too. The camera work is inventive and Adkins gives a good deal of range that we haven’t seen from him before, but there’s something missing. The characters all have the makings of something great and memorable, but really don’t get their chance to shine, due to a few many slow placed and way-too-much-plot heavy scenes. The movie feels a little too long for what it is. At 99 minutes, it could have had 5-10 minutes cut from it, which would have helped speed up the film. The video transfer on this is flawless. Perfect picture and sound to boot. I love Blu-ray releases with picture and audio that go hand in hand and are just pristine. I mean, isn’t that why we buy Blu? Watching Adkins walk through the desert, soaked in sweat, his clothes covered in dust and dirt, you can just feel the heat of the desert and gun fire has never sounded so meaty and awesome! The only special feature included on this disc is a 6 minute behind the scenes featurette, which is fairly basic and just includes some actor interviews and a quick overview of the film. With some smarts, style and inventive camera work, El Gringo starts the ball rolling on being a classic, but doesn’t quite make it there. When the action starts, the movie excels, with a mid-film action scene where the man gets 52 kills in 5 minutes! I know! I counted! Give El Gringo a watch. If you’re a fan of Scott Adkins then it’s a must and fans of Robert Rodriguez may find something they’ll enjoy in this.